Zinc and selenium are two trace elements that are required for human health. Each of these minerals plays an important role in the body, and insufficient levels can lead to a variety of health problems. Both zinc and selenium are required for healthy immune function, which makes these nutrients vital for keeping the body free of disease and common illnesses. Zinc plays roles in immune function, protein synthesis, cell division and wound healing. In addition, zinc is important for normal growth and development during childhood and pregnancy. Selenium is important for reproduction, thyroid function, DNA synthesis, and protecting the body from oxidative damage and infection. Zinc helps keep white blood cells healthy so they can fight off infections and disease. In addition, zinc has shown some efficacy in reducing symptoms of the common cold. A 2003 paper published in "Folia Microbiologica" noted that zinc and selenium are both important in modulating immune function. Selenium is necessary for the proper function of three different types of immune system cells known as neutrophils, macrophages and so-called natural killer cells. The thyroid has higher concentrations of selenium than any other organ in the body. 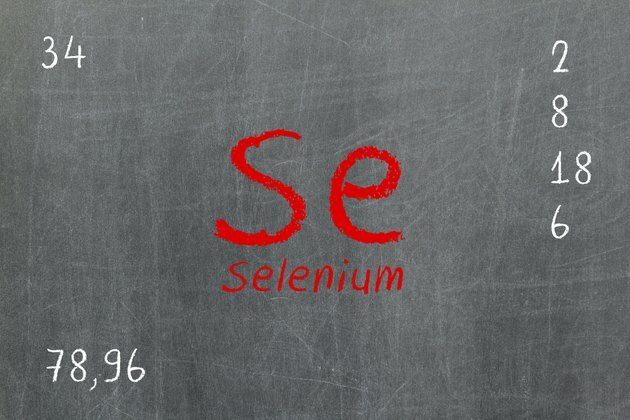 Therefore, selenium status may be an important indicator of thyroid disease. The thyroid is a small gland located at the base of the neck that controls the release of hormones that regulate the metabolism. Thyroid conditions can negatively affect energy levels and body weight, as well as other factors related to metabolic function. A 2013 paper published in "Clinical Endocrinology" noted that selenium supplementation may decrease anti-thyroid antibodies, which can help keep the thyroid healthy. Zinc may play important roles in the prevention of chronic inflammation, according to a 2007 paper published in the "Annals of the New York Academy of Sciences." The researchers noted that zinc deficiency is consistently observed in older individuals with chronic inflammation. Adequate zinc consumption may help protect against a variety of age-related inflammatory diseases. Deficiencies in either zinc or selenium can cause a number of health conditions. Low selenium levels have been linked to negative changes in mood, and deficiencies may be a risk factor for cardiovascular disease. The Office of Dietary Supplements also notes that selenium deficiencies may be linked to male infertility and one type of osteoarthritis. Deficiencies in zinc can cause a loss of appetite, impaired immune function, growth retardation and accelerated aging, among other health consequences. What Is Sodium Selenite Used For?